Many critics of plays, movies, etc. tend to write long-winded reviews that essentially narrate the entire story, scene by scene, and if you’re lucky they may include some commentary about a few pieces. Having seen the midnight showing of Scream 4 last night, I certainly want to be careful not to ruin the surprises for my readers… But I can’t NOT write about it. Let me start with this: I was really afraid that Scream 4 would end up being terrible, but I ended up being very pleasantly surprised. I liked the movie a LOT, and I’ll give some you admittedly vague reasons why. The original Scream film was so innovative, so creative, so suspenseful, and so terrifying that it stands out for me as one of the best SMART horror movies I’ve ever seen. I loved the clever dialogue, the plot twists, the building of suspense, and the way the audience can completely feel empathy for the characters. Of course, success breeds repetition in Hollywood, so a sequel was not far behind, and frankly I thought Scream 2 was GOOD but perhaps not as GREAT. It kept up some of the suspense, again has a witty script, and continued the delightful tongue-in-cheek caricature of the “rules” of scary movies. Scream 3 sucked. I actually watched it last night before heading to the movies, because I remembered so little of it… And now I’m reminded of why it wasn’t memorable, at least not in a good way. The dialogue was cheesier, the story itself less compelling, the big reveal at the end completely unimpressive. It seemed certain that the Scream franchise, like the Saw franchise, had started off brilliant and eventually run out of steam as the sequels continued. 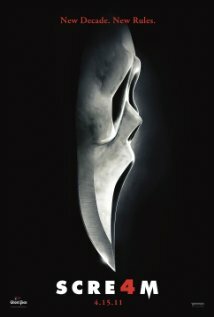 So imagine my delight when watching Scream 4 last night, when the film successfully reunited the classic characters from the first three films and pitted them all against a new fiendish serial killer, summoning up the spirit of the original film and boldly moving the franchise forward again. The clever dialogue is back, the suspense is mostly back, the action is exciting, and the script itself is actually witty and engaging again. To be sure, it’s not a perfect movie. I felt that the beginning sequence, which was so incredibly powerful in Scream and Scream 2, lacked some of the genuine horror that the first two films had. When Drew Barrymore is home alone and finds herself inexplicably stalked by a creepy killer on the telephone in the original movie, you’re shocked and appalled, feeling her terror and imagining yourself in a similar frightful scenario. When Jada Pinkett Smith, in the sequel, portrays a woman at the movies who is stabbed in full view of the theater audience, who jeers and throws popcorn at her as she helplessly bleeds out in front of them, you can feel her desperation and you can’t help but think of how terrible her plight must have been in her final moments. But here in Scream 4, I didn’t feel that. Maybe I’m jaded — maybe the neverending parade of scary movies since the original 1996 Scream has made me harder to shock, or less empathetic for victims onscreen. Hell, in a movie that tends to include quite a bit of analysis of scary movies and the audiences that love them, maybe that was the point of this movie’s introduction: entertainment, but somewhat numbed, to highlight how movie audiences have become crass and difficult to move. Or maybe the writing just wasn’t great at the beginning, and I’m giving the screenwriter too much credit. Regardless, the opening was fine, it was entertaining, but it didn’t horrify me. And that’s okay, because there were plenty of other parts of this movie that did. Again, I don’t want to give too much away… Part of the enjoyment I had for this movie was in NOT knowing where things were going, or why. But I will say that just as Scream explored scary movies in general, and Scream 2 brought us insights into sequels, and Scream 3 tried and mostly failed to suspensefully enlighten us about movie trilogies, Scream 4 addresses a very current topic in scary movies: the modern reboot of a classic favorite. And as with many of the scary movie reboots, this film brings back a lot of elements of the original, while carrying some surprises to keep it from being a simple scene-by-scene reshoot with current actors. As with the previous Scream films, this latest one talks about reboots in detail while aptly demonstrating how to succeed at making one. One other aspect was really thought-provoking for me, so I encourage you to consider it if you watch the movie: many of the characters shared intriguing dialogue about modern society’s obsession with the fame (or infamy) that comes with airing your screwed up lives to a global audience. Whether it’s webcasting (or blogging?) or reality television or tell-all books, these days it seems most of our entertainment comes in watching the real-life trials that other people must suffer through, and more often than not the spiral-out-of-control aftermath (see: Charlie Sheen) that comes of it. Uplifting stories of hope and bliss are out there, sure, but they’re vastly outnumbered. For every Extreme Home Makeover there are three Real Housewives series and whatever Jersey Shore is supposed to be. For a new batch of high school kids being stalked by a serial killer, the modern world provides plenty of opportunity to become jaded by the vicious world presented to them through a dozen forms of entertainment media. The drunk teenagers in the first Scream who rushed to see the principal’s body would be replaced by their younger siblings (or even by their kids, potentially) who would be uploading pictures to Facebook while webcasting their gleeful defiling of the body, given the chance. We’re harder to shock, more immune to genuine horror, and overall we’re less fazed by atrocity. We see it all day, every day, in things as small-scale as a single homeless person whose hunger is immaterial to us, and as large-scale as earthquakes and tsunamis killing thousands of people. And it becomes increasingly hard to make a lasting impact on us. Scream 4 isn’t going to keep you up at night, terrified that some costumed killer is in your house and is about to place the last phone call you’ll ever hear… (Though, full disclosure, I DID have some Scream-related dreams last night.) But it will definitely entertain you for nearly two hours, and if you’re the thought-provokable moviegoing sort, it may give you some good social commentary to stew over. Fans of the franchise will hopefully not be disappointed, and a whole new generation can enjoy a good scary movie in their own time, with all of the baggage that comes along with it. This entry was posted on Friday, April 15th, 2011 at 8:46 am and is filed under Uncategorized. You can follow any responses to this entry through the RSS 2.0 feed. You can leave a response, or trackback from your own site.